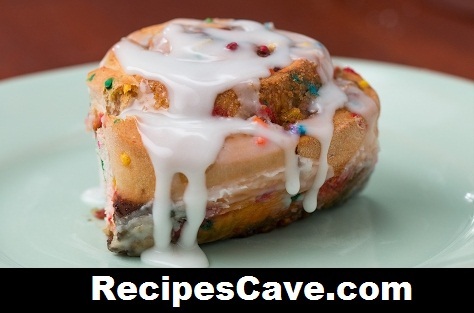 Rainbow Sprinkle Cinnamon Rolls Recipe - Here is what you'll need to cook, follow bellow steps. 1. Pour yeast evenly over the warm water and let it bloom for 5 minutes. 2. In a bowl, combine cake mix and 2 cups of flour, then pour in the yeast mixture. Stir until it starts to come together, then add the sprinkles. Gently knead the dough together into a ball. 3. Cover with a towel and let the dough rise for 1 hour in a warm place. 4. Preheat oven to 350˚F/180˚C. 4. Place dough on a floured surface and sprinkle with remaining ¼ cup of flour. Knead until it is no longer sticky (some extra flour may be needed). 5. Roll out the dough into an oval shape and spread butter on one side of the dough. Then, dust with cinnamon, brown sugar, and rainbow sprinkles. 6. Starting at the bottom of the widest end, roll dough and cut into 1½- to 2-inch pieces and place in a baking dish. Cover with plastic wrap, and rest for 30 minutes. Bake for 15 minutes, or until golden brown. 7. To make the frosting, mix powdered sugar and milk in a bowl until smooth. 8. Drizzle rolls with frosting and extra sprinkles.